Belly has only ever been in love with two boys, both with the last name Fisher. And after being with Jeremiah for the last two years, she's almost positive he is her soul mate. Almost. Conrad has not gotten over the mistake he made when he let Belly go even as Jeremiah has always known that Belly is the girl for him. So when Belly and Jeremiah decide to make things forever, Conrad realizes that it's now or never--tell Belly he loves her, or lose her for good. Belly will have to confront her feelings for Jeremiah and Conrad and face a truth she has possibly always known: she will have to break one of their hearts. I love these summer books. This is the 3rd and final installment to the series. I have been waiting all year long for it. I loved it! 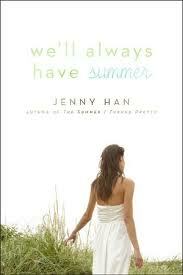 After reading these books I always wished I had a summer romance, a beach house, and for it to be summer all year long. Great book! Really great! This was told from 2 perspectives, Belly & Conrad, which was a lovely surprise. I really like to know what more than one character are thinking or doing, and this is what I got. There is only one thing I didn't like. I was waiting and waiting for a scene-a kiss-that never happened. The epilogue at the end didn't really help any without that kiss or scene that let me feel why they were together. I would have LOVED to have that kiss. I'm such a romance kind of girl, and I thought the book was leading up to it the whole time, but it never happened. Would have made the book exactly what I wanted. It was still awesome, and I love these books no matter what, but I would have really liked to see that scene. That kiss. So sue me. If you are heading to the beach or maybe just the public pool, you should pick up this series. It screams SUMMER! I love everything about these books! I hope you will too! "I’ve only ever loved two boys—both of them with the last name Fisher. Conrad was first, and I loved him in a way that you can really only do the first time around. It’s the kind of love that doesn’t know better and doesn’t want to—it’s dizzy and foolish and fierce. That kind of love is really a one-time-only thing." I love that quote. I'm close to finishing this one soon and I'm super bummed out about it. :( I just love these characters too much. It's been nice watching them grow. I always love a good series and from your review these sound like great summer reads. I'll have to keep them in mind next time I go book shopping. I am so glad you are back! I love your site! I love to read the same types of books you do. Its really nice to have a recommendation I can trust!